The single water molecule (H2O) is very small and has a hard-sphere diameter of only 2.8 Å, similar to that of the noble gas Neon (2.79 Å). Imagine a sip of water. Let us say 18 gram. This is one gram-molecule and contains 6.022.1023 water molecules (Avogadro’s number). Jungerman1 has estimated that this number is 1000 times larger than the total number of sand grains in all beaches of the world (100.000 km, 100 m wide, 1 m deep and assuming that there are 10.000 grains in 1 cm3). At room temperature, all these water molecules move rapidly in the liquid and undergo rapid changes in their interactions with their surrounding waters. Let us go a step further. Atomic mass is for 99.9% in the nuclei of the atoms, one can almost neglect the mass of the electrons. The nuclei (oxygen and hydrogen for water) consist of quarks, with a radius of < 10-17 cm. Atomic diameters are about 10-8 cm. Thus, the ratio of the diameters of the quarks and the atom is 10-17/10-8, or 10-9. Consequently, the fraction of the atomic volume in which the atomic mass is located is smaller than (10-9)3 = 10-27 of the atomic volume itself. Matter is almost completely empty! Taking all this into account, it is clear that liquid water can be best viewed as a process. That means, extremely small particles, in constant motion, with their distances and molecular volume determined by their rapidly changing intermolecular interactions. Now look at these interactions in slightly more detail. Although the water molecule is overall electrically neutral, it carries two small positive charges on the two hydrogen atoms and a single zone of negative charge on the oxygen atom. The opposite charges attract each other, a phenomenon in water which is called hydrogen bonding. A water molecule can act twice as a hydrogen-bond donor, pointing both hydrogen atoms to the negatively charged oxygen atom of other water molecules and twice as a hydrogen-bond acceptor, with the oxygen atom interacting with two hydrogen atoms of different water molecules. The number of two interactions is the result of space limitations for the approach of neighboring water molecules (Fig.1). Fig.1. Hydrogen bonds in water. These hydrogen bonds are the dominant interactions between individual waters and have an average strength of ca. 21 kJ.mol-1 at 25 °C. Such a system of hydrogen-bond interactions allows the formation of a highly dynamic three-dimensional hydrogen-bond network in liquid water (Fig.2). Water molecule reorientation times are in the order of 2 ps (1 ps is 10-12 s) and the time needed for a water molecule to move over one molecular distance is ca. 7 ps. The average half-life of a hydrogen bond is about 10-11 – 10-10 s. This extensive hydrogen-bond network provides water with a large number of anomalous properties, which play an important role in all life processes on this planet. Fig.2. The 3-D hydrogen-bond network. Now a big jump to process philosophy. In this world view, process, i.e. modes of change, is considered metaphysically prior to fixed stabilities, i.e. substances. It differs fundamentally from Cartesian subjectivism and the philosophy of Descartes which are focused on the attributes of physical bodies and a division between nature and mentality. In process thought the notion of static stuff has been displaced by the notion of fluent energy, conditioned by quantum requirements. The Western tradition of process thinking goes back to Heraclitus of Ephesus (ca. 500 BC; “all things flow”). The most sophisticated process philosophy has been created by Alfred North Whitehead (1861-1947), which was also called “organic realism” with creativity, defined as the principle of novelty, as the ultimate notion. Inert substance has been replaced by “actual occasion”, the basic “atomic” units of (dynamic) reality and to be viewed as vectors in our daily experiences. In the East, particularly the ancient Chinese philosophical systems can all be characterized as process philosophy. This applies to Daoism (Laozi, Zhuangzi), Confucianism (Kongzi, Mengzi) and Neo-Confucianism (Zhu Xi) and also for most of the different schools of Chinese Buddhism. These schools of thought have all strong roots in the ancient Yi Jing (Book of Changes). I have elsewhere described2 in some detail the similarities between Chinese process thinking and Whitehead’s categorical schemes as layed down in his monumental work “Process and Reality”3. It will not be surprising that water has been employed as a versatile metaphoric model in process philosophy. As defined by Lakoff and Johnson4, a metaphor (in Chinese Yin Yu, “hidden analogy”) is a matter of imaginative rationality, permitting understanding of one kind of experience in terms of another. They are able to create new understanding and throw intenser light on reality. I will end with a few water metaphors selected from the many that have been recorded over more than 25 centuries5. Kongzi, looking at a river: What passes is perhaps like this: day and night it never lets up. A gentleman studies water because all of the principles to which he aspires are embodied in its many manifestations (Kongzi). The man of wisdom is said to be fond of water, movement and joy (Kongzi). The mind is like water, nature is like the tranquility of still water, emotions are like the flow of moving water, and human desires are the waves on water (Zhu Xi). The highest good is like water. Water’s goodness is that it benefits the myriad living things, yet does not contend and dwells in places which the multitude detest (Laozi). The original goodness of the human nature is like the original clearness of water (Cheng Hao). The language of the waters is a direct poetic reality; that streams and rivers provide the sound for mute country landscapes, and do it with a strange fidelity; that murmuring waters teach birds and man to sing, speak, recount; that there is a continuity between the speech of water and the speech of man….(G. Bachelard). Persistent replicating systems reflect a stability that is kinetic in nature, a dynamic kinetic stability of the kind we find in a flowing river or a water fountain (A. Pross). Water, with its multiplicity of forms and extraordinary capacity for generating imagery, provides the primary model for conceptualizing general cosmic principles which apply to the behavior of people as well as to the forces of nature (G. Bachelard). References. (1) J.A. Jungerman, “World in Process”, SUNY Press, Albany, 2004. (2) J.B.F.N. Engberts, “The Natural Sciences, Classical Chinese Philosophy, Process Thinking, and Brain Lateralization”, Process Studies Suppl. Issue 16, 1, 2010. (3) A.N. Whitehead, “Process and Reality”, Corr.Ed., The Free Press, New York, 1978. (4) G. Lakoff and M. Johnson, “Metaphors We Live By”, Univ. of Chicago Press, Chicago, 1980. (5) For a more extensive study, see J.B.F.N. Engberts, “Water as a Metaphoric Model in Process Thought”, in Applied Process Thought, I, M. Dibben and T. Kelly, Eds., Ontos Verlag, Frankfurt, 2008. Uma molécula de água (H2O) é muito pequena e possui um diâmetro esférico de apenas 2,8 angstroms (Å), semelhante ao gás nobre Neon (2,79 Å). Imagine um golezinho d’água, digamos, 18 gramas. 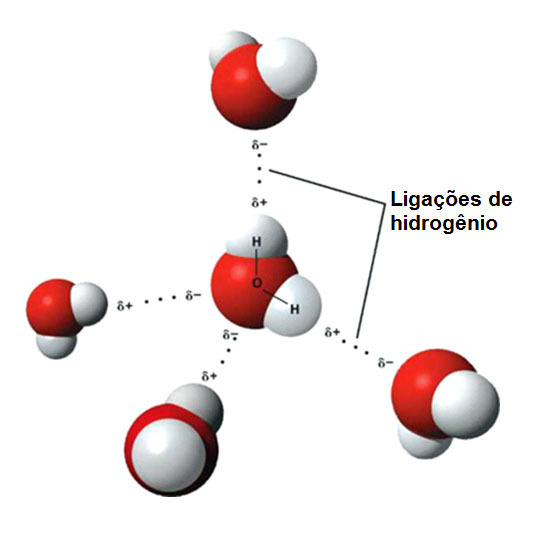 Essa quantidade representa 1 molécula-grama e contém 6.022 × 1023 moléculas de água (número de Avogadro). Jungerman1 calculou que esse número é 1000 vezes maior do que o número total de grãos de areia em todas as praias do mundo (100.000 km de extensão, 100m de largura e 1m de profundidade, supondo que haja 10.000 grãos para cada 1 cm3). Em temperatura ambiente, todas essas moléculas de água se movem rapidamente no líquido e passam por rápidas mudanças em suas interações com as águas adjacentes. Vamos dar um passo mais adiante. Praticamente 99.9% da massa total do átomo fica no núcleo; podemos quase ignorar a massa dos elétrons. Os núcleos (oxigênio e hidrogênio, no caso da água) são constituídos de quarks, com um raio menor que 10-17cm. O diâmetro do átomo é de aproximadamente 10-8cm. Assim, a proporção dos diâmetros dos quarks e do átomo é de 10-17/10-8, ou 10-9. Consequentemente, a fração do volume atômico onde a massa do átomo está localizada é menor que (10-9)3= 10-27do volume atômico propriamente dito. A matéria é praticamente vazia! Levando tudo isso em conta, fica claro que a água líquida pode ser vista como um processo. Isso significa, partículas extremamente pequenas, em movimento constante, com suas distâncias e volume molecular determinados por suas rápidas mudanças de interações intermoleculares. Agora vamos observar essas interações com um pouco mais de detalhes. Embora a molécula de água seja eletricamente neutra, ela carrega duas pequenas cargas positivas nos dois átomos de hidrogênio e somente uma zona de carga negativa no átomo de oxigênio. As cargas opostas se atraem – um fenômeno na água chamado de ligação de hidrogênio. Uma molécula de água pode atuar duas vezes como doadora de ligações de hidrogênio, direcionando os dois átomos de hidrogênio até o átomo de oxigênio com carga negativa de outras moléculas de água, bem como atuar duas vezes como receptora de ligações de hidrogênio, com o átomo de oxigênio interagindo com dois átomos de hidrogênio de diferentes moléculas de água. 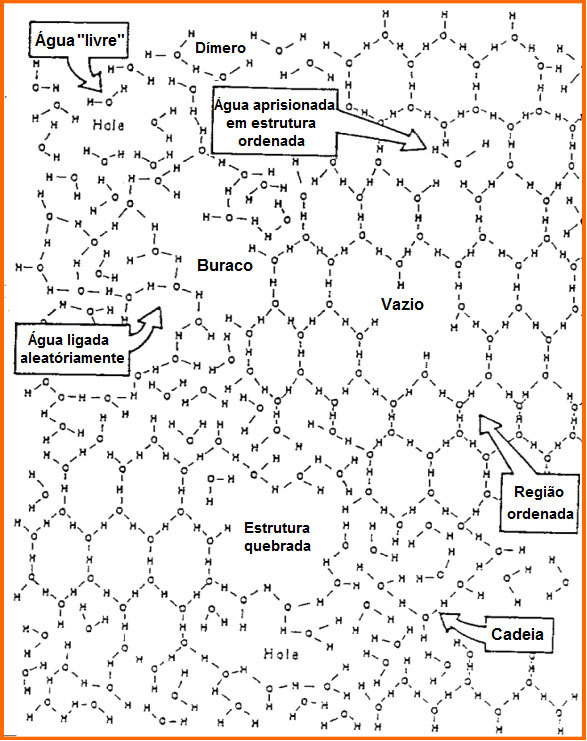 Esse número de apenas duas interações se explica pela falta de espaço para que ocorra a aproximação de moléculas de água vizinhas (Fig.1). Fig.1. Ligações de hidrogênio na água. As ligações de hidrogênio são as interações dominantes entre águas individuais e possuem uma força média de aproximadamente 21 kJ·mol-1 a 25°C. 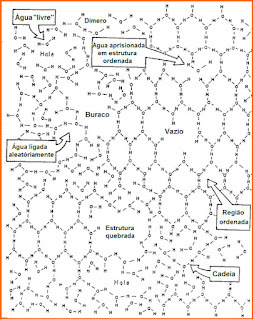 Esse sistema de interações permite a formação, na água líquida, de uma rede tridimensional altamente dinâmica de ligações de hidrogênio (Fig. 2). Os tempos de reorientação da molécula de água estão na ordem de 2 picosegundos (1ps equivale a 10-12s), e o tempo necessário para que uma molécula de água se mova sobre uma única distância molecular é de aproximadamente 7ps. Em média, a meia-vida de uma ligação de hidrogênio é aproximadamente 10-11˗10-10s. Essa extensa rede de ligações de hidrogênio fornece água com um grande número de propriedades anômalas, as quais desempenham um importante papel em todos os processos vitais neste planeta. Fig.2. Rede tridimensional de ligações de hidrogênio. Agora, vamos dar um grande salto para o processo na filosofia . A partir dessa visão de mundo, o processo, isto é, as formas de mudança, é metafisicamente considerado anterior às estabilidades fixas, isto é, às substâncias. Fundamentalmente, isso difere do subjetivismo cartesiano e da filosofia de Descartes, as quais se focam nos atributos dos corpos físicos e na divisão entre matéria (res extensa) e pensamento (res cogitans). No pensamento sobre o processo, a noção de coisa estática foi substituída pela noção de energia fluente, condicionada por exigências quânticas. A tradição ocidental de pensar o processo data desde Heraclito de Éfeso (há cerca de 500 a.C; “todas as coisas fluem”). A mais sofisticada filosofia sobre o processo foi criada por Alfred North Whitehead (1861-1947), também chamada de “realismo orgânico” com criatividade, definida como o princípio da novidade, como a noção máxima. A substância inerte foi substituída pelas “ocasiões reais”, unidades “atômicas” básicas de realidade (dinâmica) para serem vistas como vetores em nossas experiências diárias. No oriente, especificamente, todos os antigos sistemas filosóficos chineses podem ser caracterizados como filosofias de processo. Isso se aplica ao Taoismo (Laozi, Zhuangzi), ao Confucionismo (Kongzi, Mengzi), ao Neoconfucionismo (Zhu Xi), bem como à maioria das diferentes escolas do budismo chinês. Essas escolas do pensamento têm fortes raízes no antigo Yi Jing (O Livro das Mutações). Em outra publicação2, descrevi com algum detalhe as semelhanças entre o pensamente de processo chinês e os esquemas categóricos conforme descritos por Whitehead, em sua obra monumental “Processo e Realidade”3. Não seria surpresa dizer que a água tem sido empregada como um modelo metafórico versátil do processo na filosofia. Como Lackoff e Johnson4 definiram, uma metáfora (em chinês Yin Yu: “analogia oculta”) é uma questão de racionalidade imaginativa, permitindo o entendimento de um tipo de experiência em termos de outra. Elas são capazes de criar novos entendimentos e lançar mais luz à realidade. Concluirei citando algumas metáforas sobre a água selecionadas dentre tantas que vêm sendo registradas há mais de 25 séculos 5. Kongzi, ao olhar para um rio diz: “Tudo aquilo que passa é talvez assim: dia e noite sem cessar”. “O bom homem estuda a água porque todos os princípios a que ele aspira estão incorporados em suas muitas manifestações” (Kongzi). “Considera-se que o homem sábio afeiçoa-se com a água, com o movimento e com a alegria” (Kongzi). “A mente é como a água, a natureza é como águas tranquilas, as emoções são como o fluir das águas, e os desejos humanos são ondas na água” (Zhu Xi). “O maior bem é como a água. A bondade da água é que ela beneficia uma miríade de seres vivos, ainda assim não reluta e habita em lugares que a multidão detesta” (Laozi). “A bondade original da natureza humana é como a clareza original da água” (Cheng Hao). “A linguagem das águas é uma realidade poética direta; córregos e rios dão o som às paisagens silenciosas do campo, e o fazem com uma estranha fidelidade; onde o murmurar das águas ensina os pássaros e os homens a cantar, falar, recontar; existe uma continuidade entre o discurso da água e o discurso do homem” (G. Bachelard). “Sistemas de replicação duráveis refletem uma estabilidade que é de natureza cinética, uma estabilidade cinética dinâmica desse tipo encontramos na correnteza de um rio ou em uma fonte de água” (A. Pross). “A água, com sua multiplicidade de formas e capacidade extraordinária de gerar imaginação, fornece o modelo primário para conceituar princípios cósmicos gerais que se aplicam ao comportamento das pessoas, bem como às forças da natureza” (G. Bachelard). (1) J.A. Jungerman, “World in Process”, SUNY Press, Albany, 2004. (2) J.B.F.N. Engberts, “The Natural Sciences, Classical Chinese Philosophy, Process Thinking, and Brain Lateralization”, Process Studies Suppl. Issue 16, 1, 2010. (3) A.N. Whitehead, “Process and Reality”, Corr.Ed., The Free Press, New York, 1978. (4) G. Lakoff and M. Johnson, “Metaphors We Live By”, Univ. of Chicago Press, Chicago, 1980. (5) Para um estudo mais aprofundado, veja: J.B.F.N. Engberts, “Water as a Metaphoric Model in Process Thought”, in Applied Process Thought, I, M. Dibben and T. Kelly, Eds., Ontos Verlag, Frankfurt, 2008.